"Just for tonight. "Until their chance reunion takes a sharp turn... toward twins. Tech billionaire Benjamin Bennett can't resist a steamy weekend with Sloane Sutton--his crush on her goes way back. But when he tracks her down, she's pregnant--with twins! Now their fling needs trust to survive. Benji wants a wedding; his family claims she's a gold digger. But Sloane won't be bought--or married. Can they find common ground...and a shot at forever? 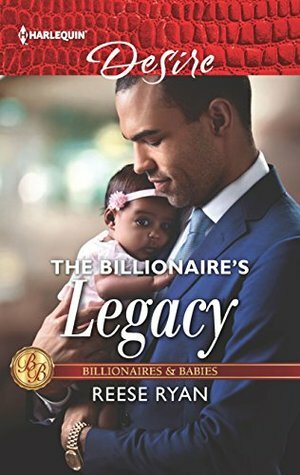 The Billionaire's Legacy is the ideal billionaire romance. It's nothing I haven't seen before but adding a pair of unexpected twins--gave the story a nice twist. Plus who doesn't love a good guy? Benjamin also known as Benji, has loved Sloane all of his life and when he sees her again many years later--his love for her only deepens. Sloane is slightly older--and she has plans, none of which include her best friend's younger brother. BUT, put together a timid mutual attraction, lust, and the perfect opportunity--and what you get is a night of passion that leads to an unexpected pregnancy, an excited unknowing father-to-be, and a bashful slightly older mom-to-be. Sloane and Benji's story was adorable--and kind of heartbreaking. It's amazing what secrets and lies can do to a relationship. But what you get by the end of it is a love story that you can root for, and two babies whose cheeks you wish you could really squeeze. While it wasn't widly original, it was definitely heart-warming and a quick read that I rather enjoyed.